System Integrity Protection (SIP) locks down certain Mac OS system folders to prevent modification, execution, and deletion of critical system-level files on the Mac, even with a root user account. While the SIP security feature is enabled by default on all modern Mac OS releases, you may find yourself in various situations where you need to check SIP status to find out if it is enabled or disabled on a particular Mac, or to otherwise confirm the SIP status on any Mac. There are two ways to check System Integrity Protection status; by using the command line, and by using the System Information profiler tool. 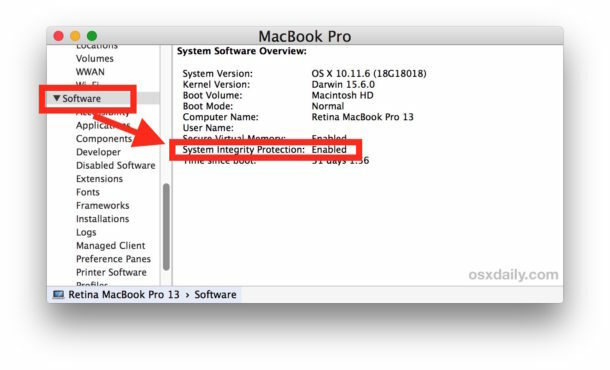 This article will show you both methods to see how to determine if System Integrity Protection / SIP is enabled or disabled on a Mac. You can check any Mac for SIP protection by using the command line. This is particularly great if you need to remotely check SIP status through ssh, for example. 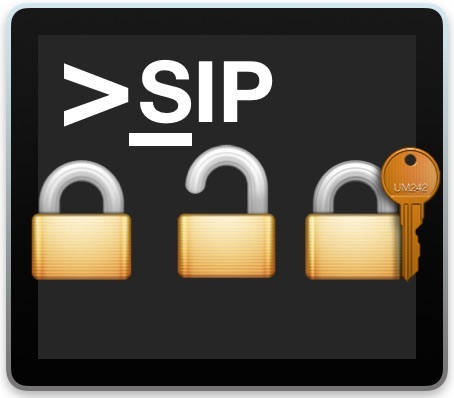 If SIP is enabled, you likely want to keep it that way. If SIP is disabled, you will likely want to turn it back on. Again, if SIP is enabled, you almost certainly want to keep it that way. And if SIP is disabled, you likely want to turn it back on again to enjoy the protection that SIP offers. What Folders Does SIP Protect in Mac OS? Those directories are protected from modification (adding, deleting, modifying, editing, moving, etc) from any administrator account and even root accounts, the latter of which is perhaps why SIP is sometimes called ‘rootless’. Only if System Integrity Protection is manually disabled can you have modification privileges of those directories, and disabling SIP requires an admin password and boot access to a Mac. Aside from the security benefits offered by SIP, it also can prevent deletion of system files and system resources in Mac OS (whether intentional or accidental) since those critical files and folders do not have modification access while the feature is turned on. Again, don’t turn SIP off unless you have a really compelling reason to do so, and even then then you’ll almost certainly want to quickly turn it back on again. As previously mentioned, SIP is enabled by default on all modern Mac OS software releases. This includes macOS Mojave, macOS High Sierra, MacOS Sierra, and Mac OS X El Capitan, and it’s safe to assume all future Mac OS system software versions will have SIP enabled by default as well. If the version of Mac OS is older than what SIP supports, the feature will not be available, and neither will be the ability to check the status of SIP with the csrutil command, or the System Information method. If you have any other methods of checking SIP status on a Mac, or any comments, thoughts, tips, tricks, or other noteworthy info about System Integrity Protection, share with us in the comments below! Where do you see this error? Can you take a screenshot of that error and when you see it? Send it to osxdailycom@gmail.com if possible. My guess is that you have an Adblock-type extension enabled which is preventing you from loading something on the site, though I am not sure what since I can not reproduce the error myself. OSXDaily.com is free and supported entirely by ads, so it’d be nice if you could whitelist our site so that we can (hopefully!) continue to exist. Regardless let’s try to troubleshoot the message, as I have never seen that one before. I cannot reproduce the error that you describe in Google Chrome. Not sure whether you’re a Mac user or not, but without doubt Safari is the best browser. If you’re a PC user you can still download Safari for Windows. I wouldn’t use Google Chrome unless you have software that stops Google tracking you. I find Safari, is not as good as Opera for streaming video, which support html5. Thanks for the tip. SIP was enabled, but it was nice to be able to confirm it so easily. OSXDaily is a great service. The easiest way to check SIP status is to click on the Apple logo>About this Mac>Overview–System Report>which takes you to the same window. Mark, thanks. Yes, your way is the easiest. Boom. You have your SIP Status displayed right there, along with software version, uptime, boot volume, user name, computer name, etc. I think that’s the fastest, all using the keyboard, and can be done very quickly. But I like using Spotlight for launching apps. Thanks, after using Macs since 1992, I’ve never heard of SIP ! Checked it out, SIP was enabled. SIP is fairly new. It was first introduced in macOS Sierra, I believe. My machine is a hackintosh so its custom. SIP is enabled but kext signing is disabled and 2 others are disabled. Guess you can’t hack with everything turned on/protected. and a trillion things have happened since then. Should all the different line items also show “Enabled”? If not how can they be set to Enabled? On my mac running High Sierra, I only see two such lines under the software header within system information: System Virtual Memory and the aforementioned SIP. Both are enabled by default.